My reading quilt has been relegated to its summer place, resting until cool nights once again descend. My reading tapers off as the days grow longer. Still, there's plenty of good reading on my nightstand. ~My Cousin Rachel by Daphne du Maurier. A suspenseful delight. Not as chilling as du Maurier's best known work, Rebecca , but worth a look. ~What is Reformed Theology? : Understanding the Basics by R. C. Sproul. A book I felt I needed to read. I was right. ~(Audio) Bonhoeffer: Pastor, Martyr, Prophet, Spy by Eric Metaxas. I must confess, I checked this out of the library on two separate occasions. I just couldn't get through it, despite my interest in this intriguing story. A friend had it on audio, so I borrowed it. This is my first foray into books on CD, and I like it. ~(Kindle) A Place for Weakness: Preparing Yourself for Suffering by Michael Horton. In preparation for this book discussion. ~Loving the Church by John Crotts. Not quite what I expected, but something I really need right now. ~(Kindle) Lady Susan by Jane Austen. It's been entirely too long since I've read something by Jane! ~Nine Marks of a Healthy Church by Mark Dever. What are you reading? 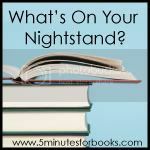 Link up your list at 5 Minutes for Books. All your books look intriguing to me! I may just look into the book discussion group and read along. I always benefit from those (and it's nice to see Becky will be doing it too!--she always inspires me with her comments). Next book, Karen Kingsbury's "Leaving" and a myraid of other books. I normally read many at the same time. I think I need to read the What is Reformed Theology book, too - thank you for mentioning it! And I want to read the Daphne Du Maurier book.I don't think I knew she had written anything other than Rebecca. I haven't even heard of Lady Susan!! But I do hope to read some more Austen soon -- Sense and Sensibility or Emma, I think. I thought I had read all of Austen's books, but I'd not heard of that one. I'll have to look it up. I have loving the Church on my literal nightstand -- a friend offered it to me after I commented on it on her blog. I'm not sure when I'll get to it, but I want to. I hope you enjoy listening to Bonhoeffer. It's on my reading list this month. I've read most of Austen's books, but I don't think I've read Lady Susan. Thanks for pointing out the discussion for A Place for Weakness. I've not read du Marier, sounds intriguing! I have been reading all fiction lately and am determined to start on my nonfiction pile this month! I'm glad that you've found a way to enjoy the Bonhoeffer book. And I really, really liked My Cousin Rachel. It's a nice piece of suspense and fiction.